Virtualization in the data center is a stable and proven approach for IT efficiencies; from desktops and servers to networks and storage. Irrespective of the virtualization implementation (host-based, appliance or controller-based), storage virtualization is a core ingredient to deploy economically superior architectures. 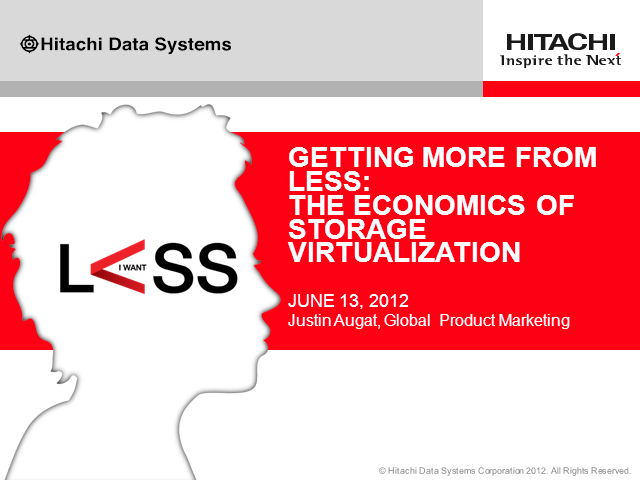 Join Justin Augat from Hitachi Data Systems to understand the types of costs that storage virtualization can directly address (and reduce), the qualitative benefits of virtualization and converting these to cost savings. He will also discuss quantitative methods to measure and predict cost savings that come from virtualization with respect to data migration, space reclamation, storage consolidation and storage management.